You are invited to CLEC Open House to examine current 2016-2018 books of the Children's Literature Examination Center and the Lois and Lowell Lueck Collection (2016-2017). After the current Open House, the 2016 books will be available in September 2018 for checkout in the Curriculum Library by WIU educators, students and area educators who have completed the library's checkout form. The WIU Curriculum Library is open to the public. Enjoy the selection and share with school librarians. Individual Refreshments served as you browse gorgeous books! "Teaching NGSS Science in Today’s Classroom"
This conference is designed for early elementary through the middle school educators who desire to learn more about teaching science as it aligns with the Next Generation Science Standards. Presenters will be sharing strategies, ideas and activities for linking their science instruction to the three Dimensions of Science: Scientific & Engineering Practices, Crosscutting Concepts, Disciplinary Core Ideas and the NGSS Performance Expectations. 12:00-1:00 pm Mini-sessions; 1:00-1:45 pm Lunch; 1:45-2:30 pm Announcements & Door prizes. Multiple presentations by practicing science teachers are planned for PreK-8 classroom teachers during each of the three 55-minute morning sessions. These 50-minute presentations will provide practical and classroom tested ideas for science activities and will include a variety of informational handouts and activity sheets. Session #3 will be immediately followed by the mini-sessions where participants move from station to station of their choice spending 10 minutes receiving information on a specific topic, demonstration, or activity plus a handout for reference. Time will permit participants to visit 5 or 6 stations of the 10 or more stations at levels (PreK-3), (3-5) and (4-8). Interested in learning more about Graduate School at Western Illinois University? Plan to attend the Western Illinois University Career Fair and WIU Graduate Program Expo. Many WIU graduate programs will be present at the Expo and available to discuss their program offerings as well as answer any questions you may have. A School of Graduate Studies representative will also be available to answer any questions you may have concerning the Graduate School at WIU. Additionally, the Career Fair will have companies in attendance so that you may network with employers and learn about internship and job opportunities. The Career Fair and WIU Graduate School Expo will be held March 6, in the University Union Grand Ballroom from 12 p.m. to 3 p.m. This event is free and open to students, staff, alumni, and the public. Professional attire is required for entrance into the Career Fair. For more information, please contact the School of Graduate Studies at (309) 298-1806, email Grad-Office@wiu.edu, or visit www.wiu.edu/grad. On Saturday, March 3rd the Maurice G. Kellogg Science Education Center hosted the Western Illinois University Regional Illinois Science Olympiad for the 31st year. During the day-long event seven middle/junior high school teams and ten high school teams participated in 46 science-related events such as Astronomy/Solar System, Battery Buggy, Disease Detectives, Helicopters/Wright Stuff, Herpetology, Hovercraft, Mystery Architecture, Roller Coaster, and Tower Building. At the conclusion of the day’s competition an Award Ceremony was held in the University Union where students received medals for finishing in the top four positions of each event. The top three teams in each division earned the right to advance to the Illinois Science Olympiad State Competition on April 21st at the University of Illinois, Champaign. Mercer County High School, Schuyler Industry High School, and West Central High School (Biggsville). School (Junior Varsity), and West Central Middle School (Biggsville). Chemistry,Curriculum & Instruction, Engineering, Geology, Mathematics, Nursing, and Physics. MACOMB, IL – The Western Illinois University teacher education programs in the Departments of Mathematics and Foreign Languages and Cultures recently received national recognition from their Specialized Professional Associations (SPA) as part of the Council for the Accreditation of Educator Preparation (CAEP) program review process. The Math Education program received national recognition from the National Council of Teachers of Mathematics and the Foreign Languages: Spanish and French Education programs received recognized by the American Council on the Teaching of Foreign Languages. The University's Educational Leadership, graduate Principal and Superintendent programs as well as the School Psychology, History and Science (Biology, Chemistry and Physics) programs were recognized in Spring 2016 and the Elementary Education, Special Education and Early Childhood programs were recognized in Fall 2016. The WIU English and the Reading Specialist programs were recognized in Spring 2017. The teacher education programs in Music and Art are accredited by their own accrediting organizations (National Association of Schools of Music and the National Association of Schools of Art and Design) and do not require national recognition. All of the University's teacher education programs are currently accredited by the National Council for the Accreditation of Educator Preparation (NCATE). For more information on the national recognition process, contact College of Education and Human Service Assistant Dean Greg Montalvo at (309) 298-1690. Dr. Christine Anderson, presenting on "Trauma Informed Pedagogy: Flight, Fright, or Freeze: What is a Teacher To Do?" Your WIU Alumni Association began a tradition not long ago with the first of many Western Wednesdays After Hours! Hundreds of alumni have joined us every month for great food, great conversation and a few beverages! Join Kellie Larrabee, QC Graduate Admissions Counselor, to celebrate 75 years of graduate education at WIU. 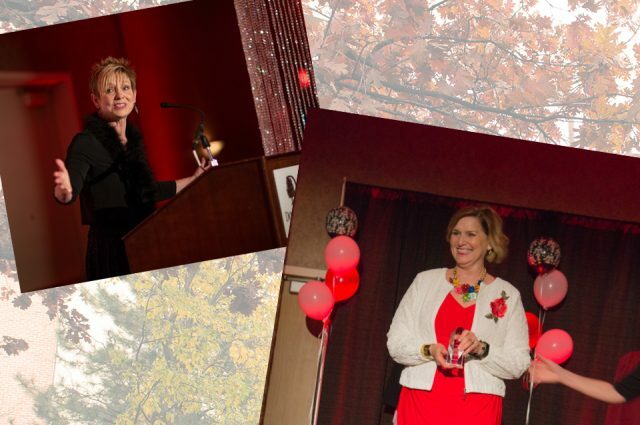 Illinois State University gave Diane the Ben C. Hubbard Leadership Award, which recognizes the achievements of a person who has promoted, championed, or achieved one or more significant goals benefiting education in Illinois.